We know that a small set up of an office requires more than 2-3k unit of electricity per month, imagine how much does an industrial unit require? What would be the monthly electricity charge? Save your electricity bill by installing solar water heater and generate your own electricity, get uninterrupted power supply 24x7, 365 days. According to a study, we can save 50% of the amount from solar energy systems. Solar power products have gained importance as they are cost-effective and quite easy to install. The Solar powered system is environmentally friendly. There is no chance of chemical and smoke emissions. Heating water made easier- Go Solar, fetch the solar power! We, at Photon Energy Systems, are committed to manufacture and supply of high quality solar power products.. The Thermal Division of Photon is dedicated to ETC based solar heating systems with state-of-the-art machinery for manufacturing tanks & flat plate collectors. 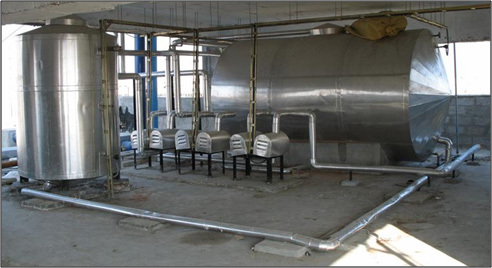 Our expertise of more than 22 years makes us one of the best industrial solar water heater manufacturer in India. Our technical expertise, quality assurance, and excellent after-sales service are an icing on the cake and acts as an added advantage to prove itself as one of the preferred choices in the industry.